“This, in concentrated from, is the image of the post-war Welfare State Englishman: shabby, and not concerned with appearance: poor—he has a bike, not a car; gauche but full of agnostic piety; under-fed, under-paid, over-taxed, hopeless, bored, wry”. Indeed, post war poetry is the reflection of death, destruction and violence. The life became meaningless in those days. There was no purpose of life; if there was any; that was to destroy the other nation or dominate it. Larkin’s poetry belongs to meaningless era of war, therefore, it is hard to find positivity in his poetry; however, if digged deep, there is still hope and possibility of meaningful life in the poetry of Philip Larkin. There are some critics, who have defended Philip Larkin and the poetry of movement with the assertions that it has realism though sad-eyed. In early poems of Philip Larkin, we find a little possibility of positive life. For instance, the poem titled “The Less Deceived” talks about avoidance; Larkin wants to convey a message to be “less deceived” rather than “more deceived” from life. There are always hurdles in life and it is difficult to go on while ignoring those hurdles therefore, the only solution is to face them. Negativity can be turned into positivity with a little effort. Although Philip Larkin has a negative mind and he sees negativity prior to positivity yet at the end of every poem he leaves hope for the readers. There may be less hope but it is certainly found, if perused minutely, in almost every poem of Philip Larkin. A misinterpretation of the poetry of Philip Larkin is that it is being read with a pessimistic attitude. If one tries to search optimism, it can definitely be found in his poetry though it is very less. The “Going” and “Wedding-Wind” are worth mentioning. The poem “Going” majorly deals with death even then it describes the social problems along with sexual relationships. Larkin simply describes what is going on in front of us. It is not his duty to give solution to every problem. He puts questions and leaves everything on the minds of readers. It is on the rehears; how they perceive things whether positively or negatively. In poem, “Wedding-Wind” a unique happiness has been depicted by the poet on wedding night. Definitely, the happiness of the newly-married woman offers hope; its worth matters or not; the poet leaves this question unanswered and ends the poem with a question mark. Hence, it is certain that there is hope as well as positivity in the poetry of Philip Larkin if searched but at the same time it is clear that he has blended negativity with positivity and positivity is always dominated by negativity. It is, therefore, we find more negativity and less positivity in the poetry of Philip Larkin. Thus, the final statement of the poem leaves a positive impact on the readers that still and wait can bring back the right things. This poem can also be added in the list to ensure that possibility of positive meaningful life is certain in the poetry of Philip Larkin. Philip Larkin has also written so-called love poems. These poems are neither romantic nor sexually positive but they totally unwrap the failure of every individual in love-life. Approach of the poet even in love poems is pessimistic, whereas mood of the poet is rebellion. In this way, we can defend Larkin to the extent that his poems are tentatively positive. 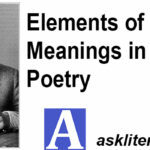 There are certain poems, which can be searched for positive meanings but they are very less in number. If it is said that Philip Larkin’s attitude towards life is entirely positive then it is not true at all. His views towards life are pessimistic. There is very less optimism in the poetry of Philip Larkin. Hope apparently cannot be found in the poetry of Philip Larkin but it is searched and excavated by the reader and with a lot of effort, positive meanings can be found in it. We may defend Larkin in this regard but cannot justify that his approach, towards life, is positive.